A kid growing up in a Spanish speaking country in the 1970s and 80s was likely exposed to Mafalda, the comic creation of Argentinian Joaquín Salvador Lavado (also known as Quino). The comic ran in Argentinian papers between 1964 and 1973 and republished into little books that were widely read in Latin America. 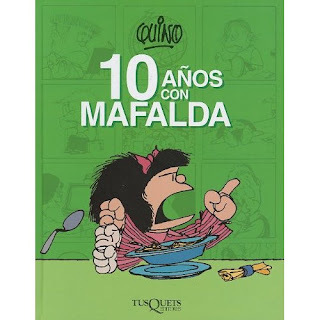 I loved reading it as a kid, but it wasn't until recently when I read, 10 Años con Mafalda (Tusquets Editores México, 2nd ed. 2009), that I truly appreciated its genius. Mafalda is a precocious six-year old who worries about world peace and hates soup. She is surrounded by her quirky friends (Felipe, a smart kid who hates homework and tortures himself for his failings; Manolito, a capitalist kid always with a scheme; Susanita, a frivolous antifeminist; Miguelito, a dreamer and philosopher, and Libertad, a tiny kid named "Freedom") and family (her father who's bent on destroying the ants that eat his prized plants; Guille, her baby brother, fan of Bridgett Bardot; and her mother, a housewife). The comic strip is a true original, but it has elements of early Peanuts (kids wise beyond their years contemplating existential conundrums), Calvin and Hobbes (smarty-pants kid with a huge imagination and skeptical of the world), and Doonesbury (biting social commentary). Quino managed to skewer politics and human nature in a funny and accessible way. Although the political references are dated (Argentina was under military junta and the Cold War was pretty hot), Mafalda's concerns about political freedom and social inequities are still relevant today and her relationship with her parents are timeless. 10 Años con Mafalda is a treat for anyone. If you are learning or know Spanish, get it in the original. Otherwise, some of the small Mafalda books are available in English. Man: Change the world! Ha! Things of the youth. Mafalda: Let's make some noise, kids! It turns out that if you don't hurry to change the world, it's the world that changes you! Mafalda: But...why do I have to do it? Her mom: Because I order it. I'm your Mother!! Mafalda: If it's a question of titles, I'm your Daughter!! Mafalda: And we graduated on the same day! Or not? Mafalda: Mom, was your first boyfriend this one, or who? Thanks for introducing me to a new comic book character especially one of another culture. These are often hard to come by these days. Growing up, I loved reading PEANUTS and CLAVIN & HOBBS. I love Mafalda and still keep finding her in my in-box, mostly shared by South American friends though she sometimes turns up speaking English too--versatile child. Lovely to learn about her history. Now going back to your previous blog entry as I truly want to know how to make my blogger look more like a website. Thanks Sylvia. 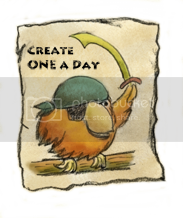 Just delighted to meet you through the MotherReader blog comment challenge. Mafalda is a great strip, and the author, who goes by "Quino" also has several books of single-panel cartoons out. You could call it the "Peanuts of Latin America", and every Spanish speaking person is aware of it and will recognize any strip you mention, even though it hasn't run for decades. But it's actually a LOT deeper and funnier than Peanuts. For one thing, it embraces the adult world, as well as the various little amigos. And sometimes that world involves things like cops tear-gassing rioters. It's one of the great serial graphics in the world, ever. No you CAN NOT call it Peanuts of Latin America. To call it Peanuts the United States should be oppressed under Dictatorship and had every single social problem that Argentina had in the sixties. So please do not compare a social satiric master piece Mafalda with a mild comic childish strip like Peanuts. I appreciate your comment. Note that I said Mafalda "had elements of Peanuts" in the sense that it involves kids wise beyond their years contemplating existential conundrums. Peanuts definitely declined in later years and is now basically a marketing juggernaut, but in its early years, it was quite a break from previous cartoons by emphasizing adult themes like existential despair, humiliation, and frustration. This post is mainly to introduce Americans and other people not familiar with Mafalda to the comic. 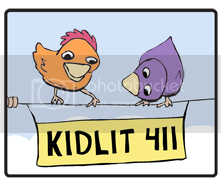 In doing so, I tried to compare it to other cartoons they might find familiar, like the subversiveness of Calvin and Hobbes, the social commentary of Doonesbury, and the wrestling with basic existential questions of Peanuts. Obviously, Mafalda is much more, because as you say, it stems from Argentina's very specific political/economic history, so I appreciate your pointing it out so forcefully. True! I totally agree, and I will add, anyone who'd never live under a dictatorship will never truly understand Mafalda. Not even the new generations.